Broomfield, Colorado, is an interesting town because it’s both a city and a county. It’s a planned community that takes pride in its natural areas, open space and commercial and residential regions. Broomfield has a population of approximately 60,000 residents, an aspect that exudes a welcoming, small-town vibe. Broomfield may be a small town, but it’s a mighty hub for shopping, entertainment, and the arts. Its largest shopping venue is the Flatiron Crossing Mall. This mall has 198 stores and includes a movie theater and an outdoor lifestyle center in its vicinity. FirstBank Center is where you can watch shows like rodeos, concerts, truck races, and circuses. The center is also a place for community events and trade shows. The Paul Derda Recreation Center offers fun activities for family members of all ages. It contains an indoor water park, kids’ play areas, a climbing wall and a spa area for parents to relax while the kids are playing. Take a stroll through Broomfield Sculpture Trail. The trail is lined with beautiful stone, bronze and metal sculptures created by local artists. Broomfield is a bike rider’s paradise because it possesses a mass trail system that links its lakes and parks together. One of the most popular scenic bike routes in the city is Rock Creek Trail, which connects Josh’s Pond to Stearns Lake. The trip between the lakes is 1.3 miles long. Visit Rock Creek Farm for autumn fun. During the fall season, Rock Creek Farm offers hayrides, a family fun area with inflatables and a petting zoo. A visit to this farm also gives you the opportunity to pick out a fresh pumpkin. 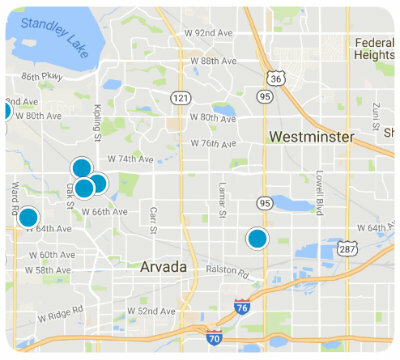 The majority of real estate properties in Broomfield are single family residences. Nearly half of Broomfield’s residential properties were built during the late 20th century, and many of them have two to four bedrooms. Once you settle into this city, you’ll notice that it’s very family-oriented, especially since kids ages five to 17 make up approximately 19 percent of the population. This town isn’t just a good place in which to raise a family; it’s also has a healthy economy in which I am proud to call home. If you have questions regarding homes for sale in Broomfield, Colorado, please reach out to us today. Search the #1 site for Broomfield Real Estate listings. Welcome to northdenvercohomes.com, your #1 internet resource for buying and selling Broomfield real estate. On this site, you will be able to find nearby school information, restaurants and grocery stores, buyer resources, seller resources, and search all Broomfield, Colorado homes for sale. Our goal is to provide you with the most valuable information and service regarding Broomfield real estate and homes for sale. Through this site, we provide you with access to MLS listings and resources for buying and selling a home, but most of all, an easy way to access expert guidance as your time to buy or sell Broomfield, Colorado real estate approaches. In today's real estate market, it takes more effort, time, and resources to sell your Broomfield home. We are personally committed and passionate not only about selling your home, but selling it for maximum market value. We offer our clients a full line of services and a network of service providers to not only provide you with maximum market exposure through our extensive and aggressive marketing plan, but to provide a tailor-made solution to handle all aspects of your Broomfield, Colorado real estate transaction including pre-listing preparation to best showcase your home. We also work with an extended list of service providers who can help meet all your needs related to the sale of your Broomfield home. Find out what your historic Broomfield, Colorado home is worth TODAY. For most people, purchasing a home is the single largest and most exciting financial decision they can make. That is why we take finding a home in Broomfield, Colorado for our clients very seriously. We're not only committed to finding you a home in Broomfield, but to finding you the absolute best Broomfield home on the market at the best possible price, and if one does not exist on the market, we'll search off-market properties and do our very best to find you the right Broomfield, Colorado home. This website also serves as a tool for clients to search properties currently on the market, receive up to the minute market updates through email, and even request showings. Start searching now OR let us do it for you!